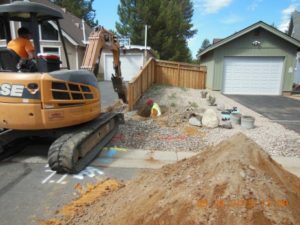 Property restoration after installation of the meter may include paving, replacement of sod, irrigation repairs, fresh wood chips, mulch, and landscaping impacted by installation. Q: Will I be notified before a meter is installed on my property? A: There will be notifications before the installation of a meter on your property. You will receive future notifications from the District containing valuable information, prior to the installation of your meter. You can expect to receive a letter a minimum of 2 weeks in advance of the planned installation. The District will install signage in your neighborhood prior to work beginning and your property will also receive a door hanger 24-72 hours prior to this work beginning. Q: Where will the meter be installed? A: The meter location is dictated by the existing water service connection. This connection is typically in front of the structure near the property line. 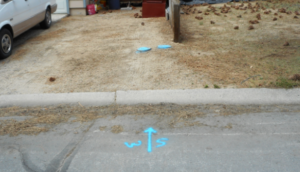 You may see a blue arrow painted on the street pointing to the approximate location of the STPUD’s water service connection and shutoff valve box. A: The District is committed to making this process as smooth as possible for our customers. However, to assist our crews please remove items such as cars, boats or wood piles. If possible move items 8 feet from the District’s water valve box, located near your property line. Q: Will the installation require my house to be out of water? A: Yes, but only for a brief period of time. 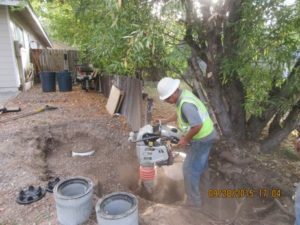 Each home's water will be shut off during water meter installation. The shut-off will occur at the District's existing shut-off valve and it is anticipated that water will be off for less than four (4) hours. You will be notified well in advance. However, due to unanticipated situations, emergency shut downs may occur without notice. In some instances, water service throughout your neighborhood may be disrupted during water valve repairs. For this reason, the District recommends each household prepare and keep at least a five (5) gallon supply of water in the event that the shut off is longer than anticipated. Q: Will anyone need to enter my residence? A: No. It is not planned for the District or our contractor to enter your residence during the water meter installation. Q: Should I do anything once water is restored at my residence? A: After meter install, or periods when your water has been shut off, please flush plumbing lines by running cold water at hose bib (outdoor faucet) or unscreened faucet (bathtub). This will help ensure any naturally occurring sediment that settled during the loss of pressure is flushed and will protect your plumbing fixtures. 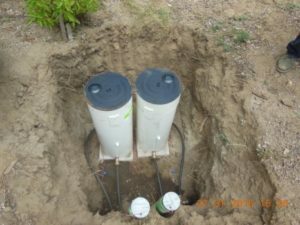 Please also run all irrigation systems after your meter has been installed to ensure your system is running correctly. Q: Since conservation is mandated, is there a website I can visit to help me begin conservation now? A: Visit the “Water Conservation" link on the District’s web site for more information and water savings tips. As a reminder the Water Conservation Specialist here at the District can be reached at (530) 543-6268 to provide further assistance with water conservation recommendations. Q: Can I just refuse the water meter installation? A: No. Since this is a legal State requirement, the District has no choice but to comply. Failure to follow through with requirements would jeopardize funding assistance and create possible penalty fines. Q: What are benefits of a water meter for me? Save money. Knowing your daily consumption history enables you to better understand and make informed decisions about your household water use and associated water bill. Access to your water usage information. In the future, you will have the option to register for the STPUD’s online water use portal to find out your water usage on a daily basis.